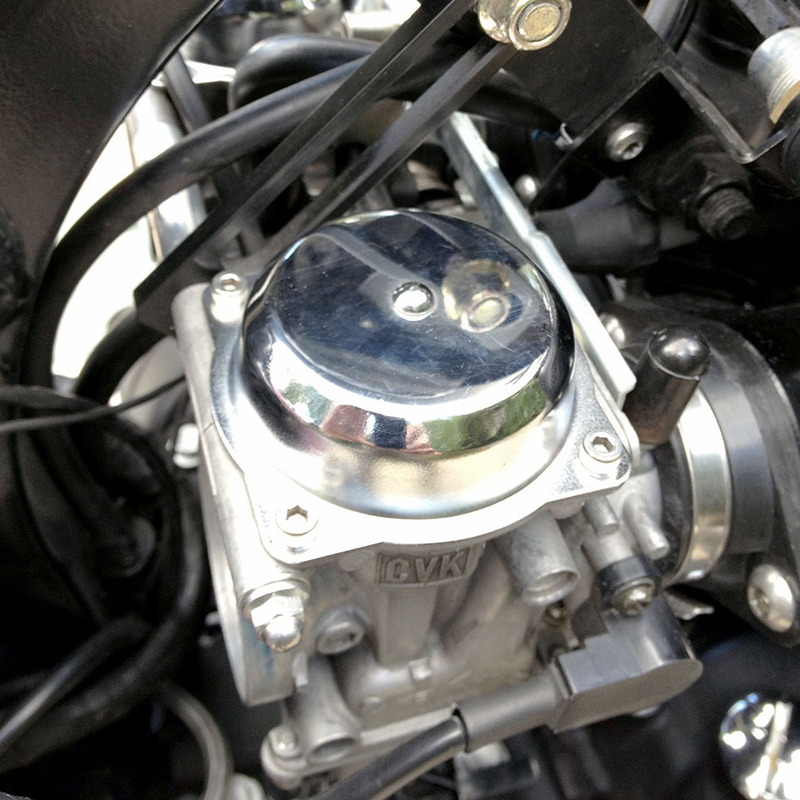 As I have shared on a number of previous posts, I have been on a journey to find the optimum carb tuning setup for the stock Keihin twin CVK carbs that are standard on the 2008 Triumph Bonneville. The reason for this journey is that I have made changes to both the stock air intake system and the stock exhaust system which necessitates that the carbs be adjusted or re-tuned. Most of what I have done to date to the stock Keihin CVK carbs has been based on a document published by Jenks Bolts, a British motorcycle shop (Jenks Bolts – Tuning Notes for the Triumph “Modern Classic” Family of Motorcycles – FEB 2007). Their tuning solutions involve using various sizes of Keihin jets, and either stock OEM Bonneville or Thruxton needles, and drilling the slides. This setup runs pretty good for me. However, in reading various online forums on Triumphrat.net, I had noticed a lot of people liking the Dynojet system. So, I purchased the Stage 1 kit from New Bonneville. As I read the instructions, I realized that the Stage 1 kit was not intended for Bonneville’s that have had the extent of modifications that mine has (see image below). I went to the Dynojet website and saw they made Stage 2 and Stage 3 kits that sounded like they would be a better fit for my setup. 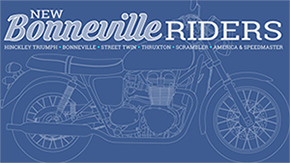 Further investiagation revealed that they do not make Stage 2 or 3 kits for the Bonneville. So, I emailed Dynojet about this issue and Mike Cory in their Research & Development department responded. He told me the The Stage 1 jet kit should still be a good starting point, but that I would need to use larger main jets than what were supplied in the kit. With the K&N pod filters he suggested that I would need main jets in the DJ140 range. Mike told me that the Dynojet jet size/number designations are roughly equivalent to the Keihin size/number system. So, a DJ140 is about the same size as a Keihin 140, which I had already. I was also unclear about what to do with the Dynojet springs which are not as stiff as the stock springs. Again, in an email reply, Mike suggested that I might try the stock springs, and then compare the performance with the Dynojet springs. He told me that the spring determines when the slides will lift, and the lift (slide) holes determine how fast the lift happens. So, I decided to test the Dynojet Stage 1 Kit conversion on my Keihin CVK’s with the suggested modifications for my setup and see what the results would be. I went through the normal procedure to remove the seat and gas tank, in order to get at the carbs. I removed the carbs from their mounts to the intake manifold so that I could easily access both the bottom and top of the carbs. Starting with the bottoms, I removed the float bowls, and replaced the Keihin 150 main jets with size 140. I replaced the Keihin 42 pilot jets with size 40 (stock). I reinstalled the float bowls. Finishing with the carb tops, I removed the covers, then the springs and then the slides. I removed the Thruxton needles and shims and replaced them with the Dynojet needles.The interesting thing about the DJ needles is that they have 4 grooves at the top end where small “E-clips” can slip snuggly into. 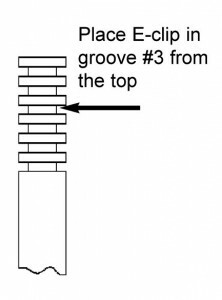 I installed my “E-clips” in the 3rd groove from the top, per the instructions below. I then added two shims (tiny washers) over the “E-clip” per the instructions in Figure A and inserted these in the slide, and the slide back into the carb. I decided to try the DJ springs first, so I also replaced the stock springs with the DJ springs, and then reinstalled the carb top covers. I then put the motorcycle back together in reverse order… carbs, filters, gas tank, seat, side covers. I may try changing the “E-clip” position per the troubleshooting instructions to improve a slight hesitation I sometimes get when accelerating hard above 4000 RPM. Even though this experiment didn’t go as smooth as originally planned due to lack of correct information, I am happy that I persevered, got the information I needed and gave it a try. I would have to say that Dynojet seems to know what they are doing as I am initially impressed and pleased with the performance of their kit. Time will tell if this holds true. I have replaced the Dynojet springs with the stock Triumph/Keihin springs. The initial sensation was that it performed a bit better. The acceleration seemed smoother to me. I also adjusted the idle mix screws out another turn (4x) to get the best all around balance. As of today, this is the best setup I have experienced. The idle is smooth, acceleration strong, response very quick, and a lot if power in the upper RPM’s. I can wholeheartedly recommend the Dynojet system. Lesson: It pays to follow the instructions, even when it isn’t intuitive or what you expect based upon other experiences! I made this correction on my Bonneville last night and so far, so good. It fired up right away and seems to deliver as good or better performance on my machine than when I had them installed improperly. I still have a rough idle, but I believe that is caused by other issues I am currently tracking down (new coil and wires coming). Since I corrected the shims position in my CVK and Dynojet setup on April 3, the Bonnie has run better. However, I noticed that it would “cough” between 2000 to 3000 rpm, mostly on deceleration, or when cold. So, I decided that my stock size 40 Keihin pilot jets might be too small for my application and I swapped them out for size 42’s. Wow, what an improvement! I had been monitoring my gas mileage for a week and the best I could get were to mid to high 30’s. Yesterday, after this pilot jet swap, I got 43 MPG on my first ride, and that is in addition to much better performance. “I then added two shims (tiny washers) under the “E-clip” You ment over the E-clip Right? I have updated the diagram to be clearer about which side of the e-clip the shims go on. Let me know if this helps. Yes, thank you! I think the drawing from Dynojet are not good, it looks like the shims is on the top of the E-clip and they wright in the instruction ” place the shims ABOVE the E-clip!? Keep up your good job on your homepage! The Washers MUST be installed on top of the E-clip, not under it! If you install the washers under the e-clip it will be like having the e-clip one groove higher. They are there to take up the space between the slide and the needles retainer, so the needles do not move up and down to much. I am assuming when you say “above” you mean literally “above” as the needle is positioned inside the carb. Thanks for making this clarification and correction! I guess it pays to read the instructions carefully and closely! You might want to upgrade your instruction diagram to make this clearer! I will make this change on my Bonneville this evening and see if it makes a difference… which it probably will! I’ll also then update my blog post per my experience! 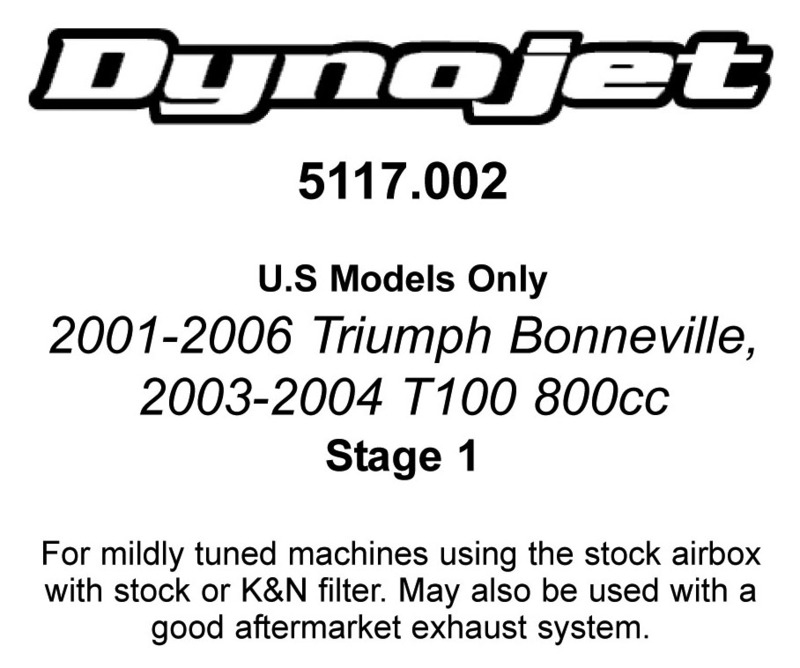 My Dynojet kit is: Stage 3 E 5321.001 “European Models Only” 2004-2005 Triumph Truxton. I don’t think Dynojet sells this kit in the US becuse of the hard pullotion laws. I ordered my kit from British Racer in Italy. And yes! I agee that Dynojet should write/highlight in their instructions why the washers/shims are placed above the E-clips so that people coming from the stock OEM needle setup are less likely to make this same mistake! Randy, thanks for all the great info on your site. In an earlier post I describe how I modified my Keihin CVK carbs following a document by Jenks Bolts. In summary, in the carb slides (the floating piston in the center that holds the needle) there is a small hole that regulates the air flow between the top and bottom of the sliding piston. They suggest drilling that hole a bit larger, which is what I did. When you do the other modifications (re-jet, remove airbox, free flow exhausts, etc. ), it shortens the throttle response time. Hey Randy, just wanted to know if you or any of the other guys can give me some advice? I have a 2008 Scrambler (carry model), air box removed, K&N pods, Arrow 2-1. I bought it like this back in April and according to the shop who serviced it last month the previous owner didn’t re-jet to suit. He had a little tinker and swapped some jets but i have a Dynojet Stage 1 kit coming which i will install asap. My question is, seen as there’s not the same amount of info on the net regarding Scrambler set up like there is for the Bonny, what jets and needle height should I use taking into account i’ve removed the air box? And, because of the mods should i have tried to track down a stage 2/3 kit? Sorry for the delay in responding. My initial thought is that you would follow similar settings as the Bonnie because the only real difference in the engines is the degree crank used. The CVK carbs are the same. My guess is you should be somewhere around the same setup as I ended up with on my Bonnie using the Dynojet needles, and the jets I used. Sorry to hear of your troubles. Hopefully all is not lost and we can sort out the issue. In order to help, can you provide the following info? What modifications have you done, if any, to the exhaust system? What modifications to the intake system have you made, if any? Which DynoJet kit did you buy, and from whom? Did you also change any of the jets when you installed this kit? For reference, the Dynojet Stage 1 kit should come with different springs and no drill bit. 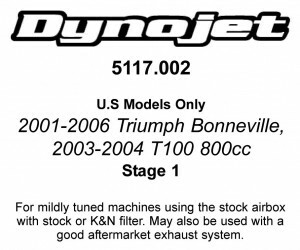 http://www.amazon.com/Dynojet-Performance-2005-2007-Triumph-Bonneville/dp/B000GV913U It is designed to work best with aftermarket pipes and stock replacement air filters like K&N. I have emailed you direct, I bought the DJ kit Stg 1 from NEC motorcycle show from distributor recommend by the DJ stand? The kit came with a drill bit but no springs? IT had 3 sets of jets and I fitted the middle set as instructed and the needles set on third notch. Bike is a 2001 790cc Bonnie running stock airbox and new filter, also fitted new inlet rubbers between carbs and head to eliminate any risk of air leaks. Have fitted different slip on end cans (Dunstall) which ran fine with std settings but stated that they were capable of working better with larger jets etc. In summary all I have done is fit the DJ bits supplied and follow the DJ instructions and sadly as a result my bike has been off the road for 4 weeks. I confess that I have not seen a DynoJet kit that included a drill bit and instructions for drilling the slides. That information for me came from an outfit called Jenks’ Bolts and was separate from using the DynoJet kit. Good luck… I hope you can ride it in the charity ride. 2) use drill provided DD32 to enlarge slide lift hole???? Sadly seem to miss a line 6) saying bike will not run again………..! It seems that you may have the wrong kit for your 2001 Bonneville as it is a Stage 2 Kit. I used a Stage 1 Kit which I ordered here: https://newbonneville.com/shop/dynojet-jet-kit/ The instructions that came with it are posted in my blog here: http://triumphbonneville.org/uploads/dynojet-stage-1-instructions.pdf You can see that the kit says nothing about drilling the slides, nor did it have the drill bit. As I understand it, drilling the slides won’t cause your problem… it only affects the responsiveness of the throttle… but I think you’ll need the springs to experience that. My advice is to try to get the stage 1 kit and use the parts from it. That’s the only kit I have experience with. I know you have a starting problem, but let’s go over proper tuning steps, first. Put the main in that pulls the hardest at full throttle / high rpm. Not just “ok”, but the best size. With that main jet, raise or lower the needle for best full throttle / midrange power. With that man jet and needle height, raise or lower the fuel level for best full throttle / low rpm power. As far as your starting problem, first you need to properly tune your fuel screws. Warm the bike up and lower the idle as low as it will idle. Adj one fuel screw, while running, in 1/4 turn increments, to its highest idle setting. Now, with the idle speed adjuster, lower the idle again to its lowest idle. Now, adjust the other fuel screw to its highest idle setting. Lower the idle with the idle adjuster and repeat optimizing the fuel screws until each fuel screw is dialed in. Now raise the idle to something under 1000 rpm. If you ended up at 1.5x turns out, your pilot jet is too large. If you ended up more than 3.5x out, your pilot is too small. I don’t generally enlarge or add slide damping holes – it makes jetting pickier for installers. The fit of the needle shims is not important (within limits). 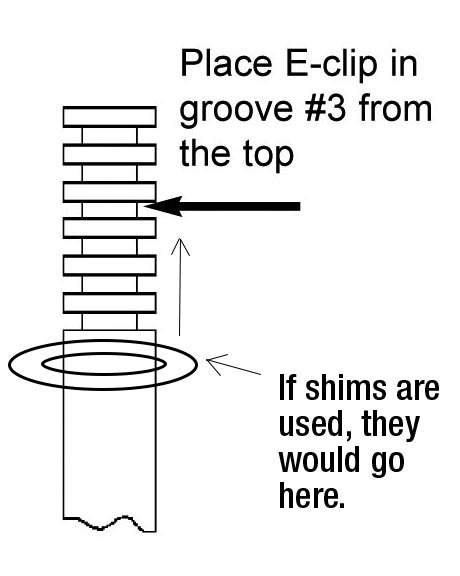 2 shims is about the height of one groove. I put the needle shims under the clip and adj needle height from there. Yes and we do make carb kit for your 790. Just looked at the link, both kits have same number E5117.002 but have different contents? Very frustrating……my kit clearly states Stage 1 on one side and then says Stage Two Instructions……..no springs but a drill bit, different jets etc….starting to realize why fitting the kit supplied and following the instruction has killed my bike….thanks DJ importer and distributor. Update……DynoJet have sprung into life, confirmed my kit is correct, now picking the bike up to take it to their workshop to find out whats gone wrong……pick up Monday, return Thursday / Friday, hopefully running and in time for the Charity Ride with Steve Parrish on the 8th…………will update with outcome. That’s good news Rob! Thanks for the update. Bike back from Dyno Jet…put a lot of effort into fixing it…………when running it has more power but starting, and bouts of fuel starvation and hesitation around 2,000 rpm means I wish I had not fitted the kit and kept fuel / carbs std. Rob, sorry to hear of your ongoing disatisfaction, even after a going over by DynoJet. I’m a little confused by the reference to getting your bike back from DynoJet… are you saying that you took it to one of their “Approved Tuning Centres?” http://www.dynojet.co.uk/index.php/atcs?type=1 — Were you able to talk to them about the poor performance at 2000 RPM, and if so, I’d be interested to know their expalnantion. Finally, given your disatisfaction, have you considered returning the bike to its original stock setup? That is very doable. Just thinking…. Dyno Jet UK picked the bike up to try fix it, They spent over 3 days on it……….the results are as I listed, struggles to start Cold or Hot (normally large backfire when hot) when started it is not very stable until very warm. It then runs OK……..basically from 2,000 rpm upwards it runs well 90% time, but can give impression of fuel surge especially if steady throttle and cornering (seems to happen more on RH bends) . Anyway they managed to install the kit (4th Groove from top on needles as bike was running lean) said that the carb balance was spot on (thank you :-)) also said that the fuel to air mix was excellent for carbs………So bike comes back home with nothing more they can do for me. So bike now back at home……seems to start after 3 or 4 attempts cold or hot but it is very fussy and you fear it will not run. It then revs hard on choke and settles to a nice smooth tick over…………so based on the infrequent hesitation, feeling of fuel starvation I can’t see that these can be tied into the claim from Dyno Jet (i.e. Battery poorly, Starter motor poorly, ignition pick ups poorly………………but it ticks over perfect, will run flat out but sometimes hesitates or feels starved of fuel (same feeling as when you are about to go onto reserve…….? Just a thought – Did you try adjusting the fuel screws to where they actually wanted to be on a running engine? The fuel screw setting procedure is provided in my previous long post. That’s the first things I’d do if we were tasked with fixing your bike. I’m actually looking for all the mods that Randy made. New to me 2008 America. Need to know what the “stock” settings are as I’ve followed the history of the bike from Missouri to Denver … and now I’m moving to Charlotte NC :). I want to jet for ~1000 ft since I am between the blue ridge mountains and the beach … EFI would have been better, but I got a deal on this bike!